Barbeque Chicken Leg Quarters is a flavorful meal for not a lot of money. Who doesn’t love to save a few bucks? The Barbeque Chicken Leg Quarters can be made in about an hour, easily in your oven. I am all for saving money when you can. My Lasagna Skillet is a great example of how you can save money. Some readers of CopyKat.com was asking me for meals that are both inexpensive and hearty. I have been trying to work on low-cost meals for awhile. Chicken Leg Quarters are an excellent way to save money; sometimes they go on sale when they are sold in 10-pound bags. This recipe uses potatoes as a side dish when you roast the potatoes while cooking the chicken on top of the bed of roasted potatoes; the potatoes pick up a lot of extra flavors. I feel a meal is all about both the central part and the side dish. If you like, you could add chopped onions, chopped bell pepper to the roasted potato mixture to bulk up the portion. Do you love money saving recipes? Be sure to check out these other ways to make delicious tasting chicken leg quarters. 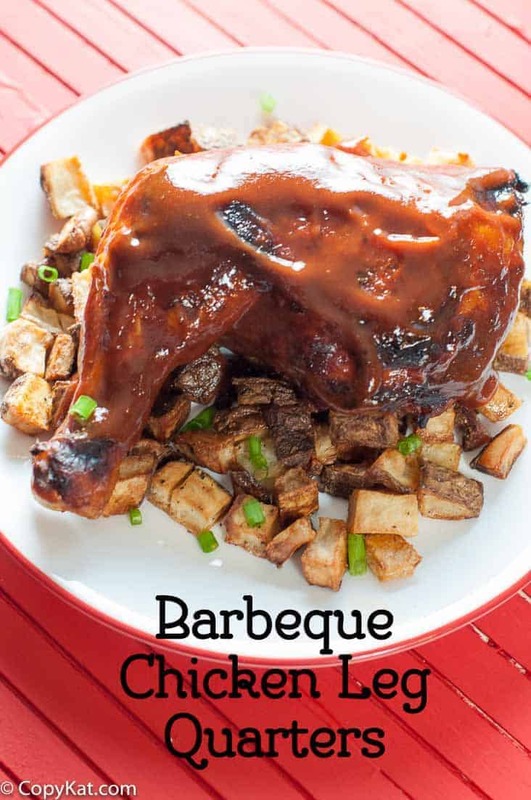 Barbeque chicken leg quarters are a delicious and cheap dinner to make. Preheat your oven to 350 degrees. Chop your potatoes and onion into fairly large pieces. Place in a dish. Add vegetable oil, and 1/2 teaspoon salt, and 1/4 teaspoon black pepper and stir together. Brown chicken leg quarters by placing skin side down in a skillet over medium heat, brown for about 2 minutes, flip chicken over and brown again for about 2 minutes. 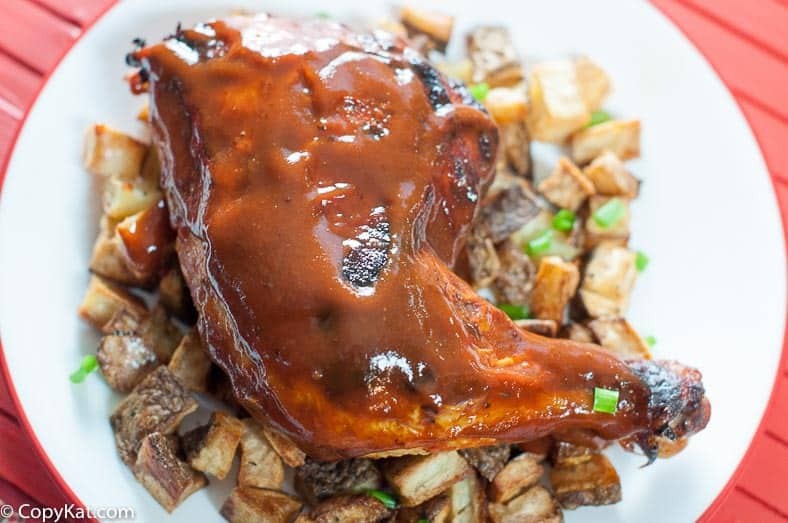 Place chicken over potatoes coat with BBQ sauce, bake chicken for about 1 hour. If desired add some additional BBQ sauce before serving. I have really enjoyed the tutorial, the recipe is good and congratulations in the good work you have done. I will tried this at home. A perfect healthy and delicious food to have after the work. Chicken leg quarters are just loved by everyone on this planet. That leg quarter, with sauces on it looks very delicious. An easy recipe which can be done, after a hectic schedule. This one deserves a try, this week in my oven. As being tired by the whole day work, who gets to cook better food for dinner. They all seek time consuming. This one is just too good to have. Wrap up, make the way to the oven, freshen up, and hot leg quarters are ready to grab.